Everyone knows that a Glossary or Definition of Terms is usually placed at the back of a book or an essay, where the reader can refer to it when seeking the meaning of some obscure terminology. But we will be constantly using terms in this Essay that have been subjected to misuse, misinterpretation and misunderstanding. Thus, to avoid any confusion, the Definitions will herewith precede the practical instruction and discussion of the various subjects. Magic is defined, in this Essay, as "The Induction of Change." Everybody, it seems, wants a better way of life and if they can't get it by hard work, then why not use "supernatural" means to accomplish one's ends? Of course, Magic is not supernatural. It is simply "natural," but some weak-minded practitioners, and a lot of superstitious non-practitioners, seem to think that it utilizes powers that are above and beyond natural laws. Scientists merely discredit it completely. Additionally, this Essay has nothing to do whatsoever with prestidigitation, or "stage magic," for that is just illusion and trickery. 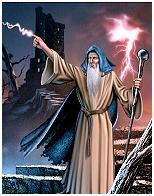 The word Magic is derived from Magus, an Old Persian term used to denote a Zoroastrian astrologer-priest. This word found its way into the English language from the Old French word magique in the late 14th century. We define Magic as a way of life. Thus any action whatsoever is an act of Magic. This includes magical ceremonies, washing clothes, using a computer and feeding your dog, for each of these actions cause a change. Magic has been, and still is, practiced in every culture. It was, and is, well-known throughout China, Tibet, Europe, Africa, India, Arabia, among the Indians of the Americas, and even in The United States. Divination is the branch of the sacred arts that deals with the viewing of a reflection of any given situation. This is the practice of consultation, assessment and seeking guidance. Commonly known as "fortune telling," this process encompasses many styles, including astrology, tea leaves, psychometry, I Ching, and of course, the Tarot. From time to time, everyone wants to know what is really going on. Does he love me? Should I look for a new job? Am I being attacked by evil forces? Why am I so distressed? The common person will often seek out a consultant: A medical doctor, a psychologist, a gypsy, an astrologer, etcetera. The magician is encouraged to perform his or her own readings or, if they are "too close" to the situation, they should at least consult another initiate. A magician should become familiar with all the various forms of divination, then select the one that is most appealing and proceed to specialize in its practice and performance. Some people just pick the easiest format - others will go on to master all .of the arts. Astrology is perhaps the most complex of the divinatory arts. There are two forms: Scientific and Reflective. The Scientific format involves constructing a chart and then looking up the meanings of the houses, signs, positions, and angles (or accessing the meanings as memorized). This form is actually an intellectual exercise. The Reflective format involves setting up a chart, noting the data, and then sitting back and letting the insights flow. This form obviously will include some intellect, but is actually an exercise of the philosophical mind and may include intuitive perception (although pure intuition is really a much higher quality). The magician may include astrological calculations in his or her rituals. For example, it would be wise to forego rites that commence during a void-of-course moon - this is that time between the last major aspect in any given moon sign and the entry of the moon into the sign that next follows. Any enterprise (mundane or magical) that starts during a void period is subject to frustration or failure. An interesting approach is to utilize the Sabian Astrological Symbols. Tea Leaves, Crystal Balls, and Magical Mirrors are all in the same category. One looks at (or into) the leaves, ball or mirror and an image (or scene) appears. This image is then interpreted. Two factors are involved: (1) Seeing the image - this is called clairvoyance. (2) Interpreting the image - this may involve the intellect, but it really should involve the passive, philosophical mind, or even intuition. Psychometry is the art wherein an object (a ring, bracelet, watch, shirt, or anything belonging to the subject) is held, and the operator reads (senses) the vibration of the item. An idea or image is then perceived, and interpreted, based on that vibration. The Tarot format involves posing a question while shuffling a deck of Tarot cards (or even playing cards), arranging the cards into a set pattern (there are many patterns), and interpreting each card according to its position in the "spread" (pattern). Occult means "hidden." That's all. It does not mean evil, the devil, satanic, or any of the other derogatory terms used by fundamentalist ministers and newspaper reporters. Occult also refers to secrecy. One principle that is always applicable to Magic is: Don't tell other people what you are doing! The discussion and disclosure of your efforts usually results in a dispersion of your magical energies and gives rise to opposition from your family and associates. Esoteric means "pertaining to the few," as differentiated from exoteric, which means " pertaining to the many." Magic is not something to be talked about, except for your "few" associates in this art. White Magic is the causing of change in order to advance the evolutionary process. This type of Magic is carried forth in the seventh physiological neurocircuit and is known as Metaprogramming - that is, the inherent programming in all lesser (lower) levels of consciousness is essentially fixed in place and unchangeable - unless one gains access to this very high realm of being wherein change is possible. This level corresponds to the concept of Wisdom. Black Magic is the causing of change in order to advance or benefit the magician at the expense of someone else. It is thus a form of burglary. It is commonly assumed that the White school and the Black school exist in opposition to each other. This is due to the fact that they are working in opposite directions. Historically, specific acts of Black Magic included Bewitching the Neighbor's Cow, Winning the affection of a Maiden, and Bearing False Witness. Contemporary, specific acts of Black Magic include Sending Spam over the Internet, Displaying Advertising intended to mislead the Purchaser, and Selling Curses and Spells to witless Clients. Yellow Magic is the maintaining of the status quo, and it seeks to preserve a harmonious, gentle way of life. Yellow Magic is performed only when either the White or the Black way gains dominance. In other words, when things get moving too fast or become stagnated. The school of Buddhist thought comes to mind. Examples of Yellow Magic include acts to Find a Lost Dog, Promote a Business, and Locate a new Dress. These actions do not bring gain at the expense of someone else but, on the other hand, they do not contribute to the evolutionary advancement of mankind. The above three definitions refer to philosophical descriptions of magical methodology, not to any form of skin color. High Magick is a term that has mixed connotations. I practiced White Magic for several decades before I ever first heard this appellation. The U.S. Department of Justice defines High Magic as "the manipulation of energies" Oh Lord, Give us a Break! Others say it is White Magick, Aegyptian Magick, Ceremonial Magic, or simply Magic as opposed to Witchcraft. With all these mixed signals being transmitted, the term will not be used again in this Essay. A Magician is the practitioner of Magic. Other terms include: Magus, Magi (plural), and Maga (a female magician). Sorcerer is another title that denotes a magician, but (again) it often suffers from confused usage. The word Sorcery derives from the Old French word Sorcerihich entered the English language around 1300 and had its roots in the Vulgar Latin term Sortiarius, from sors ("fate") - obviously meaning "one who influences fate." The appellation Sorceress first appeared in English in the late 14th century, while Sorcerer apparently did not find usage until 1526. In this Essay, the term Sorcerer is defined as One who performs Magic, but without the full knowledge of what they are doing. Thus a Sorcerer or Sorceress is essentially a Black Magician, although one who is merely stupid, uninformed or deluded, and who is fully capable of eventually seeing the error of his or her ways. This term is not to be confused with the designation of the essentially evil Black Brother.